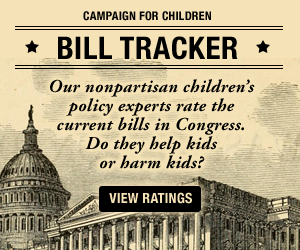 First Focus Campaign for Children sent a letter to Congress in support of the Refund to Rainy Day Savings Act. The Refund to Rainy Day Savings Act would take advantage of the unique moment in the year when a significant number of Americans receive a tax refund. S.3220 would allow tax filers to defer 20% of their tax refund in a “Rainy Day Fund” set up by the Secretary of Treasury where it would accumulate interest before being deposited directly into the filer’s direct deposit account six months later. The bill also would modernize the Assets for Independence (AFI) grant program and establish innovative pilot projects to give greater flexibility to our communities to assess and develop matched deferred tax refunds for lower-income filers, thereby creating a stronger incentive for using one’s tax credit to plan ahead and meet emergency or unanticipated expenses or reductions in household income. In addition, the bill authorizes the Secretary of Health and Human Services, through the Director of Community Services, to establish a matched savings account pilot program linked to the Refund to Rainy Day Savings Program to further encourage savings and help address our communities’ needs for economic independence.